Hibiki is 22nd Fubuki-class destroyer and/or 2nd Akatsuki-class destroyer in Kantai Collection. The Akatsuki-class wears a white and dark blue serafuku with a "III" somewhere on themselves as well as some form of black legwear. 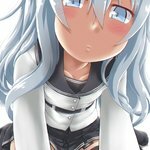 Hibiki herself has long white or silver hair, blue or grey eyes, thighhighs and wears a flat cap. The "III" is on her hat. A stoic girl and a russophile, she sometimes uses appropriate (if rudimentary) Russian in her dialogue. Her catchphrase is "хорошо" or "horosho". She is one of four girls with a remodeling which changes her name. In this case, her second remodeling turns her into her post-war self: Verniy. She also has the nickname of "Phoenix" due to her surviving from heavy damage several times during the war, avoiding more difficult battles in the process as well. The historical destroyer Hibiki was handed over to the USSR in 1947 as a war prize. She continued to serve the Soviet Navy until 1953 when she was transferred to the reserve fleet. She remained there until 1970 when she finally sunk as a practice target. Her wreck was discovered in 2012 near Karamzin Islands, Vladivostok and is now a popular wreck diving site. The following tags implicate this tag: verniy_(kantai_collection) (learn more).